Over 2000 years ago Patanjali wrote the Yoga Sutras, 196 short statements that are considered the source of what yoga is about. In the Sutras, Patanjali explains that classical yoga has eight limbs, the first two of these limbs being the Yamas and the Niyamas. The Yamas and Niyamas are ethical statements to guide us in our lives, very similar to moral codes found in the world’s religions. All well and good you say, yet what does this have to do with what most of us think of as yoga, you know, those crazy poses? What Patanjali lets us know is that in all of the eight limbs, only two of them have to do with physical activity; the asanas, or poses, and pranayama, cultivating the prana or energy of our breath. Within the Sutras, its explained that when working with all of the limbs, not just those poses, we can achieve freedom that comes with being, knowing, connecting with our true self, this being the real purpose of yoga. Without this purpose of connection, yoga becomes just another form of exercise. Yoga requires us to become mindful within the physical activity of the practice and beyond. The Yamas and Niyamas are a great way to begin to bring something of the whole of yoga into your life. Ishvarapranidhana – Acting from love, devotion, and good intent, and letting go of attachment to results of your actions. There are many interpretations of the Yamas and Niyamas. 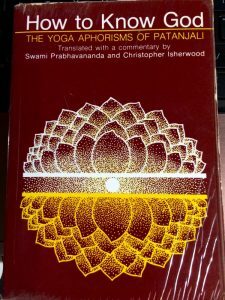 Some of my favorites are: How to Know God by Swami Prabhavananda and Christopher Isherwood, The Heart of Yoga by T.K.V. 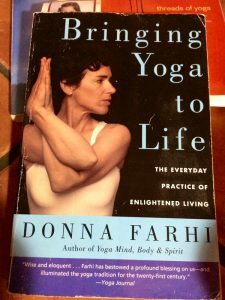 Desikachar, The Yoga Sutras of Patanjali by Edwin F. Bryant, Threads of Yoga by Matthew Remski, and most recently I have been appreciating the depth of Donna Farhi’s interpretations of the sutras, which can be found in just about any of her work (if you are not sure, begin with her book, Bringing Yoga to Life). 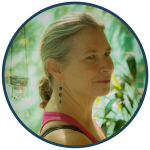 I highly encourage you to begin exploring how the Yoga Sutras can contribute to your practice of yoga, your life, and the connection to your true self. This is what the study of yoga is all about.